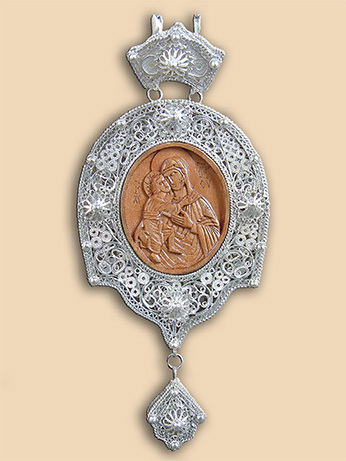 Bishop's panagia in silver filigree with hand carved Mother of God in wild pear-wood. Part of a set which includes pectoral cross NK002. Material: silver 950, wild pear-wood. 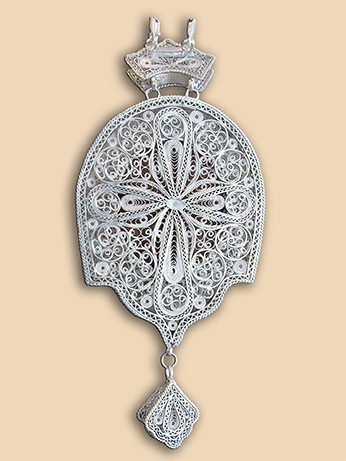 Technique: filigree, granulation, woodcarving (Nenad Bigic, Kragujevac). Weight: panagia 115 grams, chain 72 grams. Commissioned by: Father Dr. Zoran Krstic, Dean of the Orthodox Seminary in Kragujevac. In possession of : His Grace John (Mladenovic), Bishop of Sumadia.